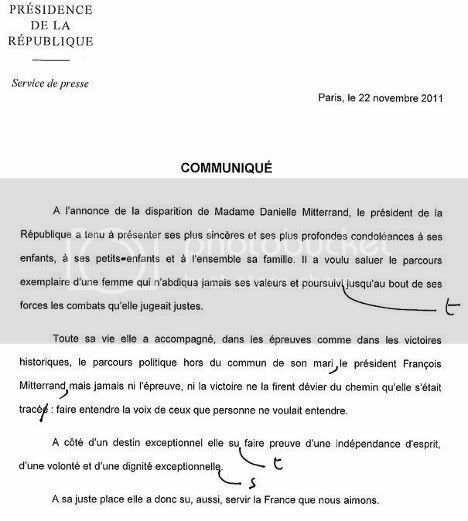 An official statement by the French president's office to mark the death of Danielle Mitterrand has been criticized for a series of grammatical errors. Danielle Mitterrand, the wife of former French president François Mitterrand, died early on Tuesday morning in Paris. The Elysée Palace, the official residence of the French president, issued its short three paragraph statement on the same day. Weekly news magazine L'Express took out its pen to note the errors in the statement, which included spelling mistakes, missed words and poorly conjugated verbs. "Six enormous spelling errors in three short paragraphs," said the magazine. Mistakes included writing that Nicolas Sarkozy offered his "deep condolences to her children, her grandchildren and the whole her family," rather than "the whole of her family." Other mistakes included those tricky rules familiar to any student of French, including knowing whether an 'e' or an 's' is required to form an agreement. The statement added an extra 'e' where it wasn't needed and forgot to make the word "exceptionelle" plural. It seems that someone working at the Elysée Palace may need to get their grammar books out again.